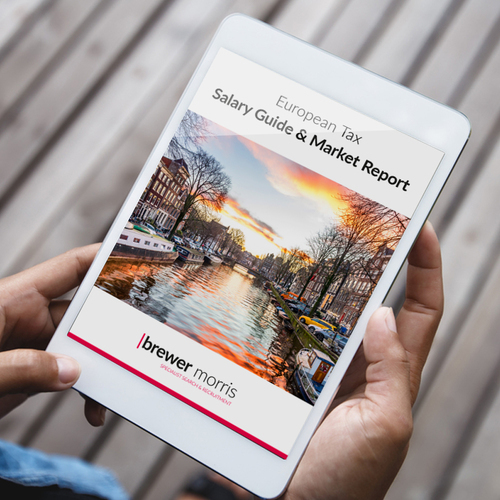 The Brewer Morris European salary guide provides insight into the key industry trends facing tax professionals. Our report includes both a complete breakdown of salaries, firstly by country then tax specialism, as well as a market commentary for each specific region. We are delighted to have insight from tax leaders across a variety of European countries to support this guide. They highlight the key challenges facing the European market which include: digitalisation, tax transparency & BEPS. February 2017 saw Swiss voters reject the Corporate Tax Reform III (CTR iii) with a majority vote of 59.1%. Whilst unsuccessful, the outcome raises questions around the countries tax landscape and how this will impact both multinational corporates as well as the Swiss taxpayer. Whilst the resulting vote means no major shift will take place, it is possible pressure will remain on Switzerland to abolish its current tax regimes, with a new reform proposal not expected until at least 2019.